Don Bluth is one of the legendary men of our time, although not many know him by name. He is the mastermind animator behind such classics as Sleeping Beauty, The Sword and the Stone, All Dogs Go to Heaven, Robin Hood and The Land Before Time just to name a very few. In the 1980's Bluth unleashed three very distinct animated video games to arcades everywhere, and in later years these classics were forgotten and buried in the sands of time as they never got justified console ports up until the early 2000's (let's just forget the Sega CD port). Two of these three games were part of the Dragon's Lair series, the first installment being an undeniable retro cult classic in every right. While you can only find the rare few who remember the first game, most people don't seem to recall the second; Dragon's Lair II: Timewarp. Does this sequel stand up to the test of time, or should it have remained unearthed? In the Dragon's Lair series the player takes on the roll of Dirk Daring, the hapless adventurer who consistently sets out to save the damsel-in-distress turned wife, Daphne, from the clutches of... well, everyone it seems. In the original game Daphne was kidnapped by a dragon, thus the title of the series, but in Timewarp it's as if everyone wants a piece of her; the evil wizard Mordroc most of all. The game consists of eight stages in which the gamer must input a series of button sequences to advance. Accidentally input one wrong move and it's back to the beginning of the stage, absolutely no mercy is given. This leads to a lot of trial and error throughout the game, but it's almost worth it when you mess up as most times you are granted with a different animation that depicts Dirk's demise. Does it sound frustrating? The truth is yes, it definitely can be. However this is what gives the game an actual challenge. Imagine spending your quarters in an arcade each time you mess up and how not only frustrated one might get, but also broke! 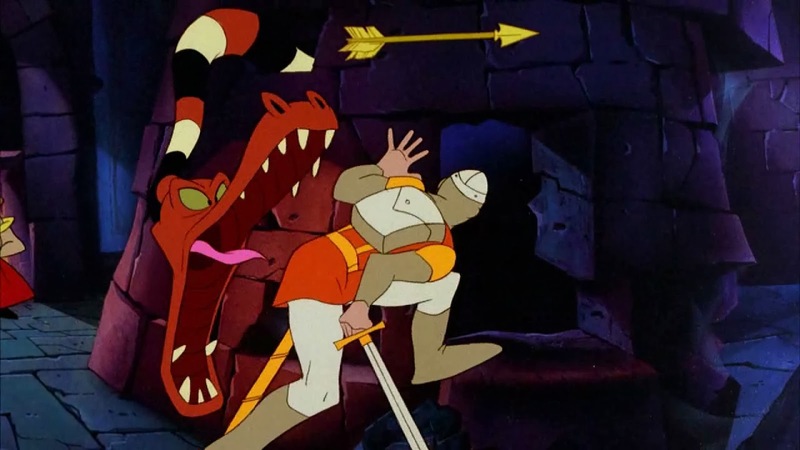 There are two noticeable key differences between Dragon's Lair and Dragon's Lair II. The latter has cut scenes that go by much faster and require a quicker reflex and response time from the player. The original game worked its way up to becoming a breath holding, oh-my-god-don't-blink fest of chaos by the time you finally faced the dragon. Timewarp begins by exceeding where the original game left off and then gradually makes a descent, so the end of the game ends up being the easiest part. There is no climax nor does the ending give the player a sense of accomplishment due to this factor. The second difference is the new hidden treasures that are a prerequisite to completing the game; the game literally forces you to find these treasures by sending you back to any stage that you missed a treasure on just before you advance to the final stage. The player is not allowed to proceed without all loot in hand. The game plays like an interactive movie, it's a series of beautifully detailed animations that are both grim and visually striking. The quality has aged gracefully since the 1980's and it really brings back that vintage Disney tone that is so well admired. There are many references to Disney movies at hand during the game, Dirk even visits an Alice in Wonderland stage. It's easy to say that the visuals are the most prominent reason why anyone would play this game either at the time of release or now (aside from that wonderful nostalgia factor). Imagine walking into an arcade when everything is in 8-bit or 16-bit and seeing this amazing theatrical performance sitting there, it would've easily stood out. The voice acting and audio are just as mesmerizing, especially during levels such as the garden of Eden and Beethoven. 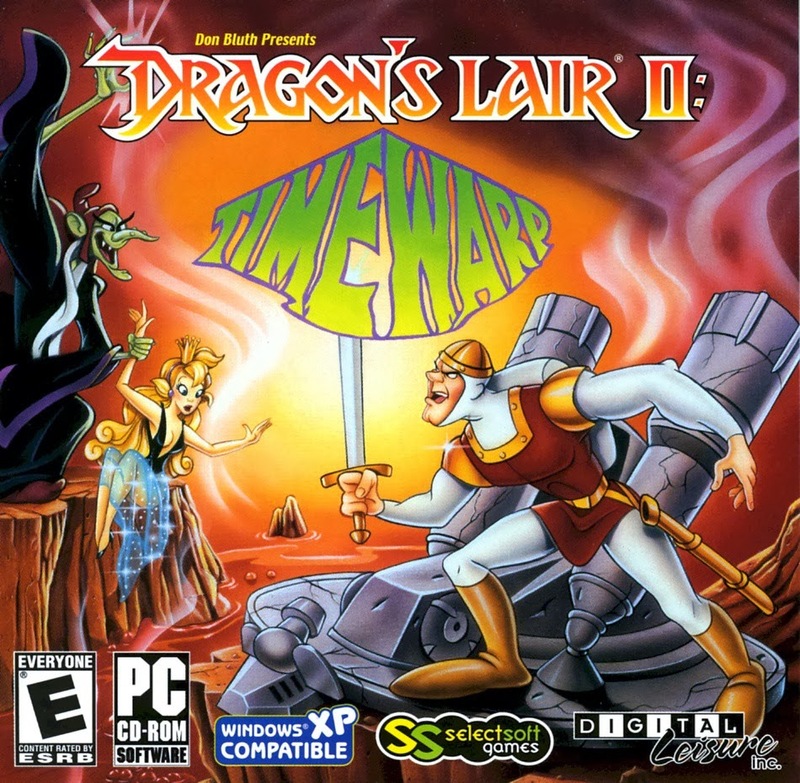 The most recent release of Dragon's Lair II: Timewarp that has come to PC (Steam), DSiWare, Wii and PS3 comes with some new features thrown in by Digital Leisure Inc., including not only the original version of the game but also the director's cut. As far as I can tell, the differences that the director's cut brings is that some of the scenes are presented backwards and the game doesn't make you input the button sequence directly after obtaining a treasure. Also included is the trailer for the game and an achievement list that requires some daunting feats to be done; such as "Bonus Ending" and "Master Rescuer" which require both modes to be completed without any move guides (displaying what direction to input). 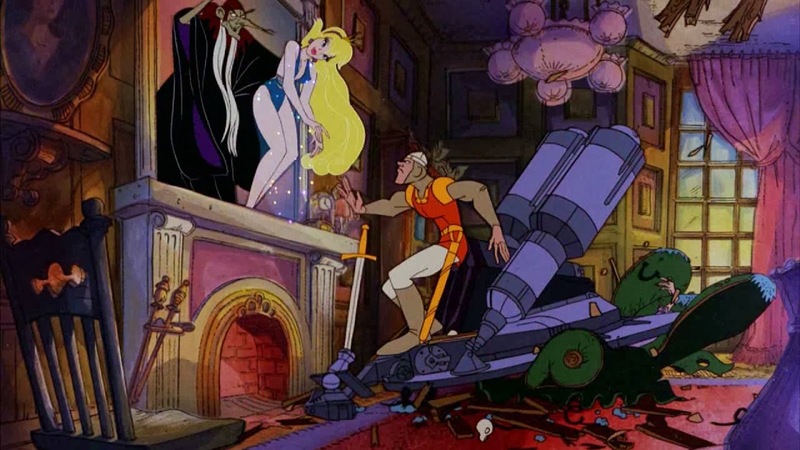 Overall Dragon's Lair II: Timewarp is incredibly weak when compared to the original Dragon's Lair. The story line is anti-climactic and it doesn't have nearly as much charisma. The game fails to give any sense of accomplishment or reward upon completion as the ending is uninspired. A good points to mention is that the publisher did leave out a lot of the gripes that the game caused in the arcade, for example they actually do let you go back to collect the treasures instead of forcing you to start the game over again. It's not a classic, but it's not a throw away either. It's also no worth $9.99. I got mine on sale for $6.49 on Steam, recommended to wait for a price drop or just go for the original Dragon's Lair.